The countdown continues in our gorgeous BB Advent Calendar. We hope you’ve had a festive weekend in the run up to Christmas. We’d love to see your pictures, so if you have any of you making Christmas biscuits or decorating your Christmas tree, be sure to tag us in them with #bbadvent, and we will enter you into a weekly prize draw to win exciting prizes including a set of our beautifully designed bespoke Christmas crackers, our gorgeous charity Christmas cards, and Brasserie Blanc gift cards to be spent in the New Year. Revealed today in our 7th window is a beautifully simple recipe for you to try at home. 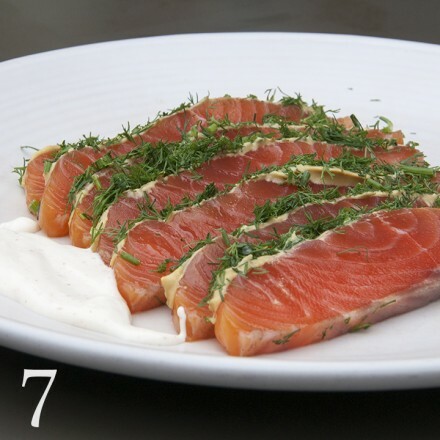 This fabulously easy home-cured salmon makes the perfect Christmas gravadlax. It is a great starter for any festive dinner and is bound to impress your guests. To try this, or any of our other stunning recipes, at home visit our RECIPES,TIPS & VIDEOS page on our website. All you need are a few store cupboard ingredients, a side of fresh salmon, and a little time and you’ll be rewarded with a real dinner party showstopper. Don’t forget to tag us on facebook, instagram or twitter with the results of any of our recipes that you try, using #bbadvent. Our advent calendar is filling up with beautifully festive pictures, recipes & weekly giveaways, waiting to be revealed day by day. You can follow along with us on Instagram, Twitter & Facebook to join in the Christmas countdown.